Bad Economics: So, who is to blame? "The price of this financial crisis is being borne by people who absolutely did not cause it," he said. "Now is the period when the cost is being paid, I'm surprised that the degree of public anger has not been greater than it has." King has repeatedly pointed the finger at the City since the crisis erupted in 2007, but this was the first time he blamed bankers for the coalition's spending cuts. It's a view that conflicts with the views of many within government. Such as, for example, Eric Pickles, who was quite happy to claim that public sector pay should be seen as equally responsible for the crisis. 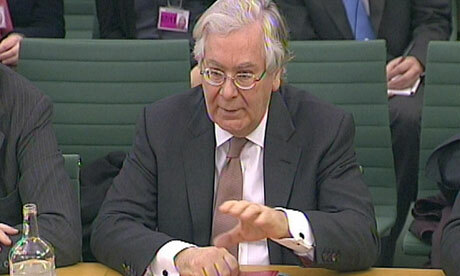 But Mervyn King is surely right. The root cause of the problems we face is not, as the media and the Tories would have it, because Gordon Brown was a profligate spender in government; it's much more to do with tax revenues falling off a cliff as a result of the banking crisis, as well as the huge amounts required to bail the banks out. And it's abundantly clear that the Tories do not want to get to grips with the need to regulate the banking industry, or to curb a bonus culture that has been responsible for encouraging short-termism. Governor King's comments shine an unwelcome light on the Tories' ideological position.